LAND BUILDERS LTD. v. ROBERT BROOKS, TRUSTEE OF B AND B REALTY TRUST, BAY STATE FEDERAL SAVINGS AND LOAN ASSOCIATION, GREENLEAF FINANCING CORPORATION. Plaintiff brings this action "demanding" 1) a judgment determining title to property claimed to be owned by it and stating that the title is good and marketable; 2) an order directing defendants to desist from harassing plaintiff's employees and agents while they are working on said property, and 3) such other relief as the Court deems just. Defendant Brooks claims good record title to the property in dispute as well as title thereto by adverse possession. He states further that plaintiff's claim to the property is barred by laches and by a Decree of Foreclosure issued by this Court on March 10, 1938. Defendant Bay State Federal Savings and Loan Association also relies on the aforementioned Decree of the Land Court for its title and claims that its mortgagor, defendant Brooks, has acquired title to the property by adverse possession. It states further that plaintiff's claim is barred by laches and that plaintiff acquired "color of title" with notice of defendant's title. Defendant Greenleaf Financing Corporation was defaulted at trial on November 23, 1980. On June 18, 1980, defendant Brooks filed a Third Party Complaint against Richard S. Bowers, Richard S. Bowers, Jr. and Lawrence R. Bowers. Upon the motion of Lawence R. Bowers, this Court entered an Interlocutory Order on August 25, 1980 dismissing that Complaint as against Richard S. Bowers and Lawrence R. Bowers. Trial was held on November 23 and December 31, 1980 and on February 11, 1981. A stenographer was sworn to record and transcribe the testimony in the case. Eighteen witnesses testified and 43 exhibits were introduced into evidence and are incorporated herein for the purpose of any appeal. Five Chalks were used in the course of the trial for the assistance of the Court. On May 7, 1981, the Court took a view of the property in the presence of counsel. On July 3, 1981 briefs were submitted to the Court. 1. By deed dated July 23, 1979 and recorded in Book 5631, Page 274, [Note 1] (Exhibit 1), South Shore Bank, Trustee under an agreement with Dexter M. Gould, conveyed to plaintiff a parcel of land (hereinafter "locus") consisting of 84,600 square feet, located on the southwesterly side of Harding Street in the town of Medfield, as shown on Appendix A [Note 2] attached hereto. 2. Prior to the purchase of locus, Robert J. Plunkett, Jr., a title examiner, was employed by plaintiff to examine the title thereto. He began his examination with a deed dated December 31, 1928 and recorded in Book 1830, Page 9 (Exhibit 4) from John M. Walker and Harry N. Walker to Thomas M. Smith. The title came down through mesne conveyances without any gap or problem to the conveyance of locus from Millis Transportation Co., Inc. to plaintiff's grantor, South Shore Bank, Trustee, by deed dated February 28, 1979, recorded in Book 5576, Page 499 (Exhibit 12). 3. After purchasing the locus and other abutting property, plaintiff divided it into two lots, obtained permits from the Medfield Board of Health and employed Mr. Matthew Sullivan to clear the land of trees and brush and to remove gravel therefrom. Plaintiff, its employees and agents were approached on several occasions while doing the clearing by defendant Brooks who claimed that he was the owner of locus and requested that work on the property cease. On February 27, 1980, defendant Brooks wrote to plaintiff reiterating his position that he was the owner of the property. (Exhibit 26). Sometime thereafter, plaintiff did stop work on the property and in April, 1980, initiated this action. 4. Defendant Brooks as Trustee likewise claims title to a portion of locus by deed dated September 21, 1964 recorded in Book 4198, Page 39 (Exhibit 21), of Blair H. Parker, Executor of the estate of Alice M. Crawford. This deed conveyed two parcels of land on the southwesterly side of Harding Street, Medfield, to defendant Brooks personally. One parcel was a one acre lot known as the "house lot" and is not part of locus. The second parcel is described in the deed as Lot C, consisting of 5.85 acres, and is as shown on Appendix A. Defendant Brooks claims ownership of that portion of locus which is included within Lot C as shown on Appendix A but makes no claim to the triangular shaped parcel included in locus which is also shown on Appendix A as "Now or formerly Mary G. Walker." 5. On September 21, 1964, defendant Brooks personally executed a mortgage to defendant Bay State Federal Savings and Loan Association, recorded in Book 4198, Page 40. (Exhibit 22). By deed dated December 17, 1973, recorded in Book 5005, Page 566 (Exhibit 23), Brooks conveyed the two parcels described above to himself as trustee of the B and B Realty Trust. 6. Prior to his purchase of the lots on September 21, 1964 one Donald H. Carvin searched the title for Brooks and his report dated September 1, 1964 (Exhibit 24), indicates that the title examination covered a period of thirty-eight years beginning with a deed from Leon D. Hughes to David C. Williams, dated March 22, 1926 and recorded in Book 1863, Page 434 (Exhibit 15). 7. Before this matter came to trial, plaintiff requested that Mr. Plunkett re-examine its title and also that of defendant Brooks. As a result of these title examinations, it was discovered that there are two chains of title to the land in dispute. 8. In 1923, Maude A. Ritchie was the owner of Lots A, B and C, as shown on Appendix A,consisting of 15 acres but not including the triangular shaped parcel which is included in locus, also as shown on Appendix A. By deed dated September 15, 1923 and recorded on October 6, 1923 in Book 1572, Page 304 (Exhibit 2) Maude A. Ritchie conveyed the property to David C. Williams. 9. By deed dated October 18, 1924 and recorded November 7, 1924 in Book 1620, Page 426 (Exhibit 3), David C. Williams conveyed the locus less the triangular-shaped lot to John M. Walker and Harry N. Walker. The Walkers acquired the triangular shaped lot through a separate chain of title and in December, 1928 conveyed locus, including that parcel, to Thomas M. Smith (Exhibit 4). As noted in paragraph 2 hereof, this deed to Smith was the starting point of the title examination conducted for plaintiff in 1979, and the title flows without difficulty to the plaintiff thereafter. 10. Even though he had already conveyed the locus less the triangular-shaped lot to John M. and Harry N. Walker on October 18, 1924 - paragraph 9 above - on December 29, 1925 some fourteenmonths thereafter, David C. Williams conveyed Lots A, B and C, including the locus, less the triagular-shaped lot, this time to Leon D. Hughes, by a deed recorded in Book 1679, Page 415. (Exhibit 14). Hughes in turn reconveyed this same property to David C. Williams some four months later by a deed dated March 22, 1926 recorded in Book 1863, Page 434. (Exhibit 15). As noted in paragraph 6 above, this last deed marked the starting point for the title examination conducted on behalf of Brooks in 1964 by Donald H. Carvin. Had Carvin gone back to October of 1924 he would have discovered the prior conveyance of these lots by the said David C. Williams. 11. The next event in the Brooks chain of title (so-called) was a tax taking by the Town of Medfield for the non-payment of 1928 real estate taxes "assessed Leon D. Hughes subsequent owner, David C. Williams" after fourteen days demand given on July 25, 1930 and after sale at public auction to the town on December 29, 1930. The parcel taken was described as containing 13 acres bounded as follows: "Northerly by Harding Street and land of Alice M. Crawford and Mary G. Walker; southerly by land of Charles W. Sawyer; easterly by land of George Hinckley; westerly by land of Geo. W. Hinckley." The instrument was recorded December 29, 1930 in Book 1916, Page 165 (Exhibit 16). 12. On July 16, 1935 some four and one-half years after the tax deed David C. Williams conveyed Lot C - a part of the property included in the tax deed - to Joshua C. Pratt by deed recorded in Book 2077, Page 370 (Exhibit 17). 13. The Town of Medfield next brought a petition to foreclose its 1930 tax title against David C. Williams (Land Court Case No. 12060) and a decree was entered in the Land Court March 10, 1938 and recorded in Book 2180, Page 853 (Exhibit 18 and 19). 14. The next instrument in the "Brooks" chain is a deed from the Town of Medfield to Nelson G. and Susie A. Tibbetts, dated October 26, 1938 and recorded in Book 2207, Page 126 (Exhibit 20). 15. By deed dated October 27, 1938 and recorded in Book 2207, Page 127 (Exhibit 20), the Tibbetts conveyed to Alice Crawford, who conveyed to Brooks individually. 16. In the Land Builders chain of title the Town of Medfield through its collector took for non-payment of taxes assessed to J. M. Walker and Sons Inc. for the year 1937 and 1938 a parcel of land described as being "Listed on the Map of Town of Medfield as Lot #914C situated on the west side of Harding Street." 17. Lot #914C as described above is situated on the north side of West Mill Street and not on the west side of Harding Street, not the locus. 18. The taking by the Town of Medfield as set forth in paragraph 16 above was released by an instrument of redemption dated August 24, 1978 recorded in Book 5631, Page 276 (Exhibit 13). 1. Does plaintiff or defendant have good record title to the premises? The Court has found that on October 18, 1924 David C. Williams was the record owner of the locus. (See paragraph 8 herein). On this date he conveyed it to John M. and Harry N. Walker by a deed of this said date, recorded in Norfolk Deeds on November 7, 1924. The Walkers then retained title until they conveyed it to Smith in December, 1928. Their deed to Smith marks the starting point of plaintiff's title search. (See paragraph 9) The chain of title then flows on without problems to the plaintiff. David C. Williams, by a deed dated December 29, 1925 and recorded on January 24, 1926, attempted to convey locus plus Lots A, B and C to Leon D. Hughes. Williams no longer owned the locus having conveyed it as set forth above by a properly recorded deed to the Walkers. The recordation of this deed to the Walkers would provide constructive notice to any later grantee of the prior conveyance and Hughes being a later grantee would thus not take the locus by this deed. See G. L. c. 183, Section 4. Hughes in turn reconveyed Lots A, B and C and the locus he never owned to Williams by deed dated March 22, 1926, recorded in Book 1863, Page 434. (See paragraph 10 herein) Since there was no title in Hughes, there was no title to reconvey to Williams. Defendants title search began with this deed back to Williams (See paragraph 6) and even though the title might flow thereafter without problems to the defendant the fact that there was no title to begin with would guarantee that there was no title at the end of the chain in defendants. The Court finds and rules that the record title to locus is in the plaintiffs. 2. What is the effect of the tax foreclosure proceeding brought by the Town of Medfield against David C. Williams on which a Land Court decree was entered? As set forth above when the tax for the year 1928 was "assessed to Leon D. Hughes, subsequent owner, David C. Williams," paragraph 11 herein, neither Hughes nor Williams was the owner of the locus. The true owners were the Walkers and the tax assessment on April 1, 1928 should have been to them. The town evidently based its assessment on the deed from Hughes to Williams dated March 22, 1926 (Exhibit 15 - see paragraph 10 herein). As has been found above this deed did not convey the locus as Hughes did not have the locus to convey, the title being in the Walkers. The town assessed the wrong person. Having done this, the town sought to foreclose its tax title in the Land Court, Case No. 12060 of which the Court takes judicial notice. The records therein reveal that the tax title examination made by the Land Court examiner failed to show the deed of October 18, 1924 from David C. Williams to John M. and Harry N. Walker, the true record title holders. As a result no notice was ever given to the Walkers of the tax proceedings and they had no opportunity to contest the same. The provisions of G. L. c. 60, §64 stating that "title conveyed by a tax collector's deed or by a taking of land for taxes shall be absolute after foreclosure of the right of redemption by decree of the Land Court" does not bar the plaintiff from now asserting that the decree is not absolute. The protection of c. 60, §64 is available only if there was strict compliance with the law and every requisite of the statute. Wood v. Wilson, 256 Mass. 340 (1926). Under the instant section notice of the proceedings, at least by registered mail, is required to all interested parties. Johnson v. McMahon, 344 Mass. 348 (1962). Since the true record title owners, John M. and Harry N. Walker, never received notice of these proceedings, by registered mail or otherwise, the Court finds that the notice requirements of c. 60, §66 were not fulfilled and that as a result, the decree is not binding against the Walkers and their successors in title. The tax sale was defective for still another reason, namely that the assessment was made to one who did not own the land. Under the provisions of Holcombe v. Hopkins, 314 Mass. 115 (1943), Wood v. Wilson, 256 Mass. 340 (1926), a subsequent sale based thereon is invalid and void. Streeter v. Worcester, 336 Mass. 469 (1957). The Walkers, as the true record title holders of the locus were the people who should have been assessed and as they were not, the Court finds that the tax decree is not binding on them or their successors in title. 3. Has defendant obtained title by adverse possession? To establish title by adverse possession there must be proof of nonpermissive use which is actual, open, notorious, exclusive and adverse. Ryan v. Stavros, 348 Mass. 251 , 203 N.E. 2d. 85 (1964). The nature and extent of occupancy required to establish title by adverse possession varies with the character of the land. Lachance v. Rubashe, 301 Mass. 488 (1938). Cowden v. Cutting, 339 Mass. 164 , (1959). Much of the land that the defendant seeks to establish title to by adverse possession could be characterized as wild land and woodland. In order to acquire title by adverse possession to an area so characterized the defendant must show that his acts concerning the land were sufficiently notorious to warrant a presumption that the owner had notice thereof. Dow v. Dow, 243 Mass. 587 (1923). Such acts may include a substantial inclosure, actual occupancy, cultivation, or the erection of buildings on the land. Poignard v. Smith, 23 Mass. 172 (1828), Labounty v. Vickers, 352 Mass. 337 (1967). Applying these principles to the present case the Court finds that the defendant has not shown that his use of the area was so open, notorious, exclusive or adverse that the true owner would have notice thereof. Although there are tracks of a faint, dirt road over a part of locus, there is no evidence that the defendant constructed buildings or erected fences to inclose the land. Nor is there evidence that the defendant occupied the land for any substantial length of time. The trees in the disputed area are much too large to have been planted by the defendant. The Court does not question that defendants and their predecessors used the area at times but there is ample evidence that numerous area residents also used it for picnicing, walking, swimming and skating before the pond dried up. The Court finds that the defendant, who was impeached on cross-examination, has not met his burden of proof needed to secure title by adverse possession. In his answer defendant Brooks raised the equitable defense of laches. Laches is an unreasonable delay in instituting suit on the part of plaintiff that results in some injury or predjudice to the defendant. Norton v. Chiodo, 317 Mass. 446 , Moseley v. Briggs Realty Co., 320 Mass. 283 . The Court rules that the defense of laches is inapplicable to the instant action. Plaintiff purchased the property in June, 1979, received a cease and desist letter from defendant Brooks on February 7, 1980 (Exhibit 26) and commenced suit on April 22, 1980. The Court finds that this was not an unreasonable delay in bringing suit on plaintiff's part. Additionally, defendant Brooks has not proved that this delay caused him substantial harm. Moseley v. Briggs Realty Co., 320 Mass. 284 . Thus, the Court rules that the defense of laches is inapplicable to the instant action. On the basis of the above findings, the Court rules that plaintiff has good record title, the foreclosure proceedings were a nullity against the Walkers and therefore are not binding on the plaintiff as the Walkers' successor in title, and that defendants' adverse possession claim based on the evidence presented to this Court is unfounded. Plaintiff has submitted 46 "Requests for Findings of Fact". Those numbered 1-30 and 32-46 are granted; number 31 is denied. Plaintiff has also submitted 25 "Requests for Rulings of Law". Those numbered 1-5, 8-17, 19, 20, 22, 24 and 25 are granted; those numbered 6, 7, 18, 21 and 23 are denied. Defendant Brooks has submitted 43 "Requests for Findings of Facts". Those numbered 1, 3, 4, 6, 7, 10-13, 16-24, 26, 28-33, 35-39, and 43 are granted; those numbered 5, 8, 9, 14, 15, 25, 27, 34, 40-42 are denied. Defendant Brooks has submitted 21 "Requests for Rulings of Law". Those numbered 1, 3, 6, 10 and 12 are granted; numbers 4, 5, 7, 9, 11, 13-21 are denied. Defendant Bay State Federal Savings and Loan Association has submitted 22 "Requests for Findings of Fact". Those numbered 1-16, 19, 22 are granted; those numbered 17, 18, 20 and 21 are denied. Defendant Bay State Federal Savings and Loan Association has also submitted 14 "Requests for Rulings of Law". Those numbered 1-3, 5, 10 and 13 are granted; those numbered 4, 7, 8, 9, 11, 12 and 14 are denied. [Note 1] All references to recorded instruments are to instruments recorded at the Norfolk County Registry of Deeds unless otherwise indicated. [Note 2] Appendix A is a portion of Chalk C to which the Court has added certain notations for the purposes of clarification. 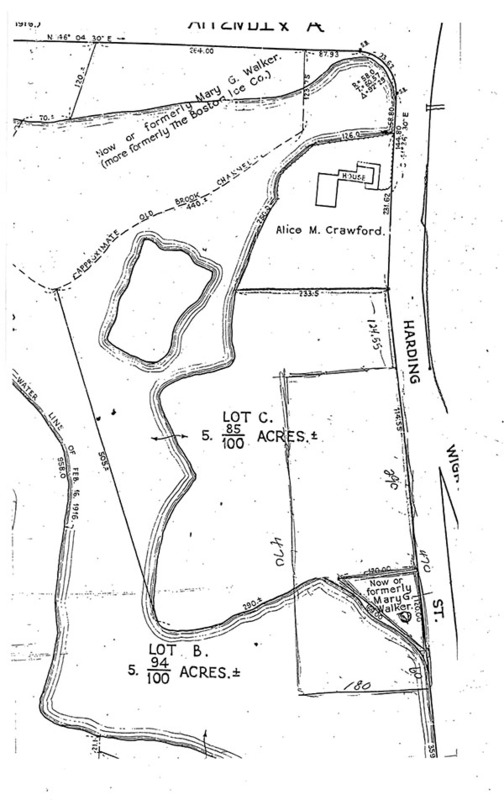 Chalk C is a "Plan of Land in Medfield, Mass." Scale 1" = 60', dated October 14, 1938, prepared by Frank L. Cheney, Civil Engineer and filed as No. 623-1938, Plan Book 122.